The old postcard shown above, proves that things do remain the same. 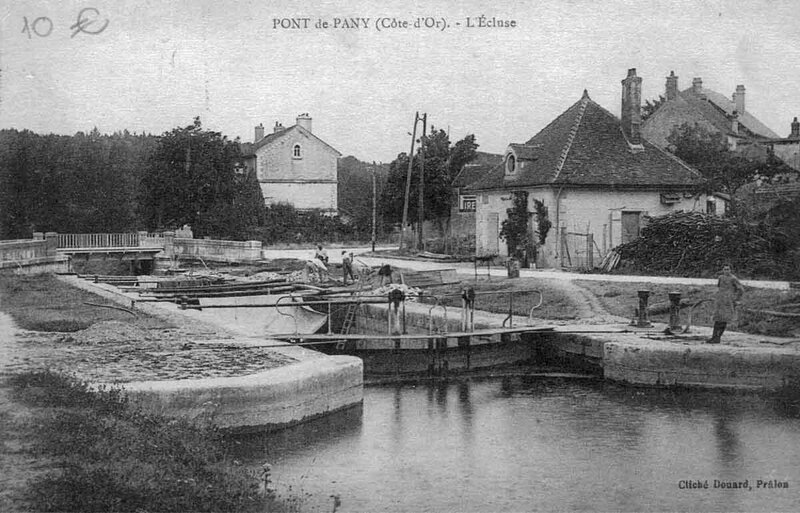 The lock 38s marks the entrance to the Valley Ouche, the canal makes a sharp right turn towards Dijon. There is an small road that passes in front of the lock house which takes you over the hills and towads Nuit Saint Georges up . Hidden in the forest you may find Chateau la Chassagne,. The mooring on the righthand side above Lock 38 is much better than below the lock. In the village you will find a bakers, pharmacy and post office. Above lock 38, comfortable and well shaded and protected from the freeway. Below the lock there is a good turning point for 30 metre barges.